THANK YOU! YOUR PLANNING TOOLS ARE ON THEIR WAY TO YOUR INBOX! 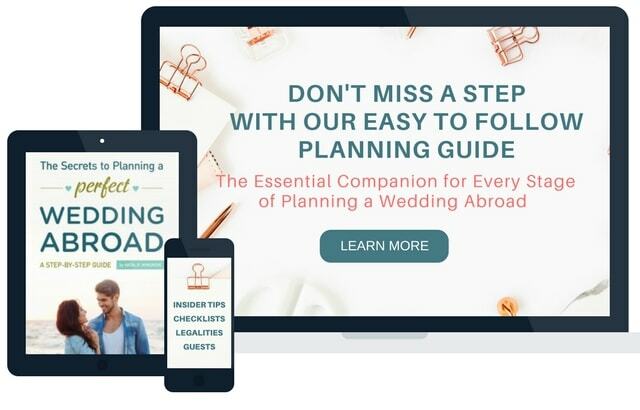 So you can ENJOY and be CONFIDENT with every decision you need to make when planning a wedding abroad, my guide takes you step by step through the planning process. Usually £12.99. Once you purchase the Guide, it will be delivered to your inbox. 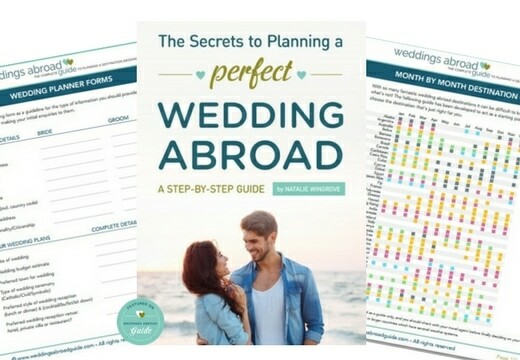 I share all the knowledge I gained while planning my own wedding abroad, pass on hints and tips from couples that have been married abroad and let you in on the insider secrets I have received from wedding professionals while running Weddings Abroad Guide for the past 12 years. An Overview of the Planning Process. Potential Challenges and Obstacles. Gaining Clarity if Getting Married Abroad Right for You. Choosing Your Wedding Destination. Different Ways to Plan. How to Choose the Right Suppliers. How to Select Your Ceremony & Reception Venues. Legal Guidelines. Types Wedding Ceremonies. Understanding Wedding Insurance. Inviting Guests to a Wedding Abroad. Wedding Invitations. Wedding Gift List. Wedding Attire. Eight Essential Planning Checklists. Little Black Book of Wedding Suppliers. Get my Step-by-Step Planning Planing Guide for just £7 in the next 20 minutes. This is the only time you’ll ever see this price!